The New Baby Beginnings Mini Rose Plant sends your congratulations to friends and family in celebration of the birth of their sweet baby boy! 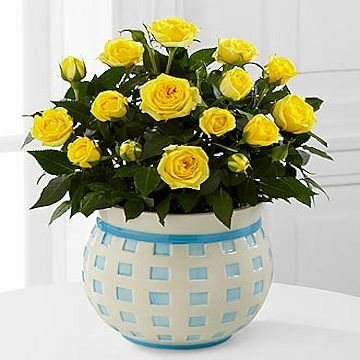 A gorgeous mini rose plant flaunts bright yellow blooms against lush green foliage to create a fantastic gift. Presented in a blue and white basket weave inspired designer ceramic container, this mini rose blooms with your warmest wishes and sentiments to welcome the new baby into the world.